No one will ever guess that this dish is dairy-free! Tastes indulgent and so yummy. Dinner is ready! Gluten-free Penne with Tofu Vodka Sauce. Yep, I said tofu. But don’t get freaked out, no one would ever guess the sauce is dairy-free! The tofu is blended with the vodka, then mixed into a tomato sauce base, so it’s super rich and creamy. Tastes indulgent and so yummy… My entire family loves it and they are not tofu fans like me. Super excited to share that I made this for dinner as part of a project I did for My Juiceman. I teamed up with them to share a “Day of Eats” on their blog using their juicer and blender. You can read my Guest Blog here. 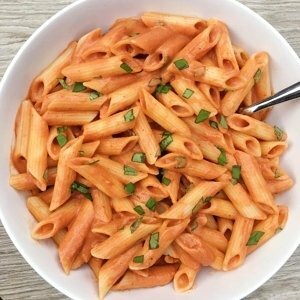 Gluten-free Penne with Tofu Vodka Sauce. Yep, I said tofu. But don't get freaked out, no one would ever guess the sauce is dairy-free! The tofu is blended with the vodka, then mixed into a tomato sauce base, so it's super rich and creamy. We make sauce early in the day and just cook pasta when ready to serve. Add garlic. Saute 1-2 minutes until just starting to brown. Add strained tomatoes, crushed pepper, basil and salt. Bring to a boil, then lower heat and let simmer. (Can be as little as 5 minutes, but we prefer at least 30 minutes to allow flavor to come out). Meanwhile, in a blender (we used My Juiceman Express), blend tofu and vodka until smooth. Add the tofu vodka mixture to the tomato sauce and let simmer for at least 30 minutes. Prepare penne according to package instructions when ready to eat.